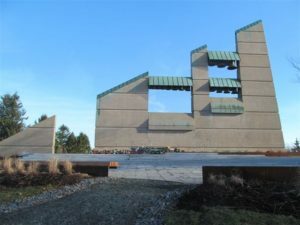 A large group of nurses from the Nova Scotia Nursing History Society attended the massive public ceremonies in Halifax to commemorate the 100th Anniversary of the Halifax Explosion. The Halifax Explosion, on December 6, 1917, resulted when a Norwegian vessel collided with a French cargo ship laden with high explosives. The resulting fire ignited the cargo, causing a devastating explosion that killed at least 2,000 people from the blast, flying and fallen debris, onshore fires, and collapsed buildings, and an estimated 9,000 others were injured. It was the world’s largest artificial explosion before advent of nuclear weapons in World War 2. 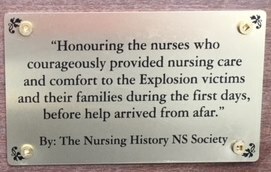 The NSNH society this year commissioned and dedicated a bench to honour those nurses who worked day and night to assist victims of the tragic explosion. Blizzard conditions prevented arrival of trains bringing health care workers from other parts of Canada, and NS nurses were true heroines. Finally a trainload of nurses and doctors arrived from Boston to help care for the wounded. 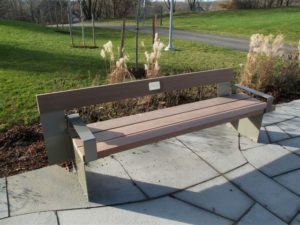 The bench is located on the grounds of Fort Needham Memorial Park in Halifax near the huge Bell Tower Monument commissioned by the government. BC History of Nursing Society sent a donation to NSNH to help pay for the bench and to show solidarity with this group of nursing historians. 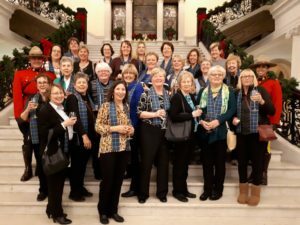 NSNH nurses also were part of the Nova Scotia delegation that travelled November 30 to Boston for the city’s annual tree lighting. Each year, to say thank you for the support Boston provided, the province of Nova Scotia sends Boston a gigantic Christmas tree. There, the NS nursing historians met and shared experiences with colleagues from that area. Information for this item submitted by Glennis Zilm. Photographs by Alan Tobacca and the NSNH website.